Many years ago when I was a kid, my parents use to rent a house “down the shore” which actually is South Jersey lingo for going to the Jersey Shore. Our family always went to Long Beach Island which has numerous little shore resorts on it, from Colegate at the southern tip to Barnegat Light at the northern tip. One year, they weren’t able to get a house on the island so they rented on the mainland instead. It was a great vacation as the house had a lagoon in the back yard where we could crab and fish from the dock in the back yard. My Mom cooked three large dishes ahead and froze them into individual meals. They were Chicken Cacciatore, meatloaf and lasagna. So for two weeks straight we ate those three dishes only except the one night we went to Morrison’s Seafood Restaurant. This happened in 1974, so for 41 years, I couldn’t even bring myself to touch the chicken cacciatore recipe. Eventually though, I had it again, and I figured out that I just didn’t like that recipe. So I decided to devise my own recipe based on our likes. For this recipe I use a slow cooker. Microwave slice onions for 3 minutes. Place sliced onions in bottom of slow cooker. Dice up bell peppers in bite sided pieces, and add them on top of onions. Add chicken thighs on top of peppers. Add zucchini and yellow squash slices. Add sherry, Worcestershire sauce, crushed tomatoes, oregano, basil and thyme. Add salt if not using canned crushed tomatoes. Place lid on slow cooker and cook on low for 6-hours. Remove chicken, and continue to cook the remaining ingredients for an additional 2 hours. Remove meat from thighs. ( I personally do not like non crispy chicken skin, so I discard it along with the bones). Set chicken aside in refrigerator. 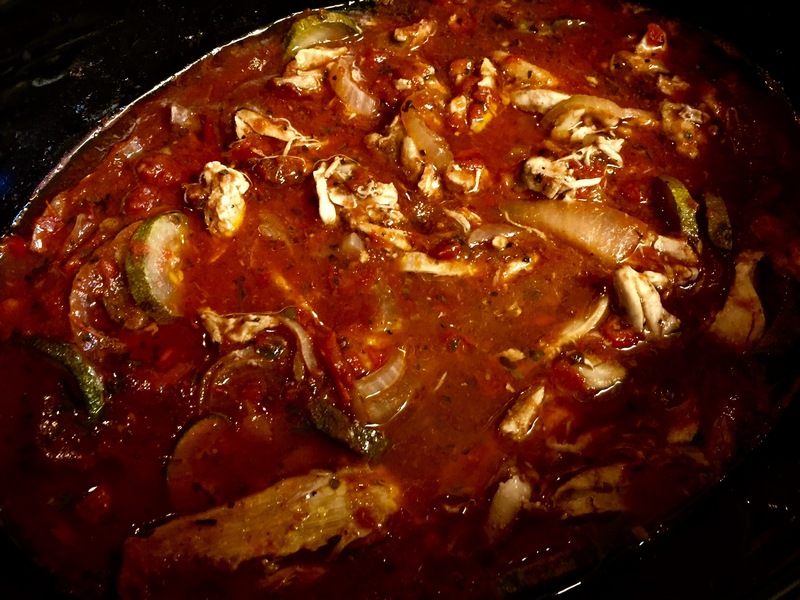 Turn off slow cooker on warm and add the chicken. (I either serve the stew on top of brown rice or egg noodles. This recipe is true comfort food.